India's culinary diversity is widely celebrated, but the diversity of the materials used in its kitchen utensils has remained relatively undocumented. Iron, brass, copper, bronze, aluminium and stone are some such materials. These metals confer medicinal and nutritive properties to the food. For some decades, they were sidelined due to New Age materials such as teflon, but the traditional vessels are making a comeback as people have begun to realise that materials like teflon have adverse health effects. Fortunately, many of these traditional cooking vessels are still available in India. It is quite common to see people of the nomadic gadia lohar community sitting by the road and fashioning iron utensils. There are also communities that excel in the craft of making vessels out of bronze, copper and even silver and gold. The use of different materials in Indian kitchens depends on what has to be cooked. Cast iron can withstand high temperature and is good for food that needs to be cooked slowly. The metal is used to make tava (skillet), kadhai (wok) and paniyaram (a pan with depressions where ball like snacks are shallow fried in oil). Cooking in iron vessels is beneficial because it is a natural way to supplement iron in food. Earlier, people ensured that they consume at least one meal a day that was made in an iron vessel. In a study published in 2013 in the Indian Journal of Pediatrics researchers report that when preschool children were served foods cooked in iron pots for three months, there was a 7.9 per cent increase in their haemoglobin levels. Another study published in the Journal of The American Dietetic Association in 1986 says that foods cooked in iron utensils are significantly higher in iron content than those cooked in non-iron dishes. “Most of the foods (90 per cent) contained significantly more iron when cooked in iron utensils than when cooked in non-iron utensils. Acidity, moisture content, and cooking time of food significantly affected the iron content of food cooked in iron utensils,” the study said. Foods like methi (fenugreek) and karela (bitter gourd) have been traditionally always cooked in iron vessels. Copper utensils also find a place of pride in the kitchen though the metal is more popular for storing drinking water because it has anti-bacterial properties. A study by the US Environmental Protection Agency, published in Applied and Environmental Microbiology in 2011, says that 355 copper alloys, including many brasses, kill more than 99.9 per cent of bacteria within two hours of contact. Copper water boilers can be seen in roadside tea stalls as copper heats evenly and is very efficient in retaining heat. However, copper cannot be directly used for cooking because the metal reacts with foods which are acidic or sour. It has to be lined with non-reactive metal like tin. The practice of coating the inside surface of copper utensils with tin is called kalai in Hindi and is an age-old craft. Care has to be taken in this as there are reports of adulterated materials being used to coat vessels and this can have a harmful effect. Today, lining is done with stainless steel also. Copper bottom vessels have also become quite common now and these retain heat. Chefs across the world, therefore, use copper vessels in making dishes where temperature control is vital. Brass or peetal too is very popular in India for making cooking vessels. It is an alloy of copper and zinc and the combination varies depending on the use. It again has to be coated with tin before use. 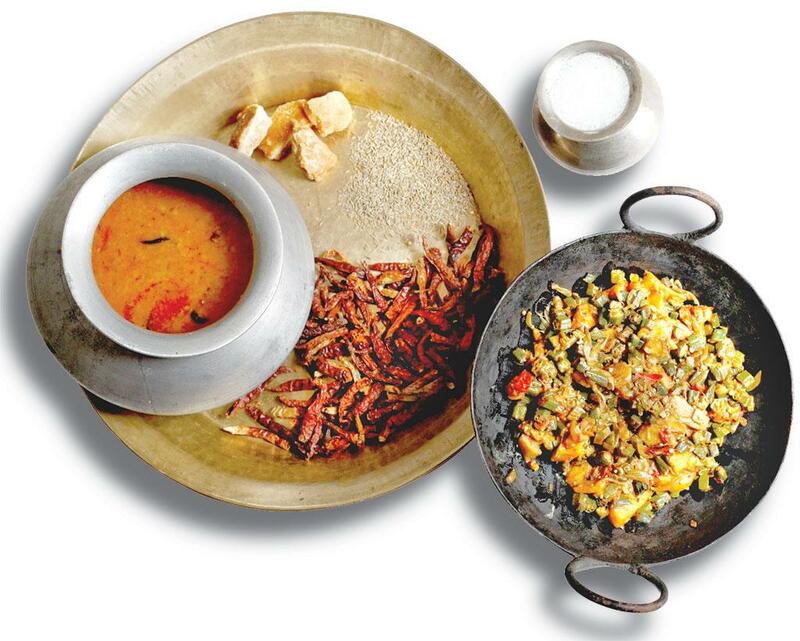 Cooking of dal (pulses), rice and vegetables in kalai-coated brass vessels is very common. Similarly, bronze vessels hold an important place in Indian kitchens. Bronze is usually made of a combination of two metals—copper (70 per cent) and tin (30 per cent). In south India, bronze vessels are made in different combinations of these metals. The urli—a traditional cookware in Kerala—is handcrafted from the metal which neither loses sheen nor corrodes. These are used for making payasam which needs to be boiled for a long period. The more seasoned the urli, the better it withstands heat. Milk does not curdle in this metaland utensils are ideal for preparing prashad or payasam in temples. Most temples in Kerala have huge bronze urlis for this purpose. Eeyam patram (usually shaped like a lota) are cooking containers crafted out of tin. These are used for making rasam, and the flavour of the metal flows into the food while it is being boiled. However, the tin utensil has very low melting point so one has to be very careful when it is placed on the gas. If the water or rasam inside is not sufficient, the vessel melts. Since wood-fired stoves were used earlier, it was safe to keep these vessels on the fire for a long time. Maintenance is the main problem cooks face while using traditional vessels. For example, iron vessels rust easily and have to be coated with a layer of oil after washing. Bronze breaks easily and has to be cured before placing on fire. Cooking and storing in bronze vessels is cumbersome because the food can react with the material. However, the improved taste and nutrition are reasons enough to use them. (This article was first published in the 1-15th July issue under the headline 'Metals with mettle').